How did you first learn about post-graduate service? I first learned about a post-graduate year of service during my formative years in high school through several role models who I looked up to that decided to do a year of service upon graduation. These individuals shared their remarkable experiences with me. In high school, I made a promise to myself that I wanted to do a year of service after graduation, more specifically with the Augustinian Volunteer Program. 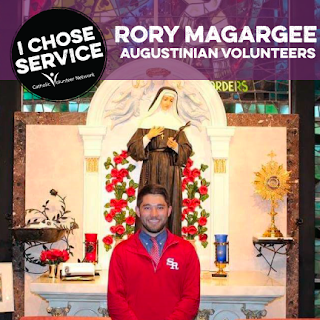 What other options were available to you, and why did you decide on Augustinian Volunteers? In today’s society, the majority of college students are aware of two options upon graduation: to go back to school and earn an a graduate degree or to secure a job and build a career. There is however a third option, which is definitely the road less traveled, and has an extremely profound impact on not only your life, but all of the lives around you, this option is to dedicate yourself to a post-graduate volunteer program. Upon graduation, I had a job offer with a major insurance carrier located in Philadelphia. I went back and forth for a few days deciding between taking the job or executing the promise I had to myself to join the AV program after graduation as I had always gravitated towards the Augustinian Order as a result of attending an Augustinian High School. I ultimately decided to join the AVs for the simple reason that I knew it would be the biggest regret of my life had I not joined. To this day, the decision to join the AVs is by far the best decision I have ever made in my life because it forced me out of my comfort zone and I learned to become comfortable with being uncomfortable, which is such a powerful tool I carry with me wherever I go. Tell us about your service experience. I was placed at St. Rita High School in the South Side of Chicago. St Rita is an Augustinian High School in which over 80% of the student body is on financial aid and is located in a very rough neighborhood in Chicago. I wore many different hats at St. Rita, I worked in the Campus Ministry Department and oversaw the christian service program; I led a group of students to a local soup kitchen every Wednesday night, I was the curator for the St. Rita Shrine Chapel, I coached Flag Football and Lacrosse, I organized and oversaw multiple retreats; I led a service trip over spring break to North Carolina, however, my primary role at the school was to get to know each of the 635 students on a personal level and to support each of them as they navigated high school, the formative years of their lives. A major charism of the Augustinian Order is to live in community, a form of intentionally living that fosters growth in each community member through sharing every facet of day-to-day life with the members of your community. The Augustinian Volunteer program expects its participants to live in an Augustinian Community similar to each clerical Augustinian Community. My community consisted of two other Augustinian Volunteers; one coming from Minnesota and the other was from California – which led to a very unique circumstance because on a fundamental level we were all from different parts of the country with very different perspectives and childhoods. Community life was very challenging and forced each member to sacrifice things that we took for granted our entire lives. Community life forced us to truly understand each other and to support each other through our year of service and as a result, was extremely rewarding as I came out of the year as a product of my community. What benefits have you gained from this experience that you might not have received otherwise? I believe that in today’s society many people tend to forget to analyze their lives and situations. The biggest benefit of my year of service was that it was a year of reflection and self-examination. I feverishly worked towards improving myself in so many ways: spiritually, professionally, emotionally and mentally. I approached my year of service as a year of “yes”, meaning that I would say yes to anything anyone asked of me. This forced me into so many indescribable situations that I was never prepared for, but I was able to learn from these experiences and lend a helping hand to someone in need. This mentality has trickled into my personal and professional life, and I picked up a plethora of experiences with knowledge and skills that I would not have had I continued to divert these requests. What advice do you have for someone considering post-graduate service? The biggest piece of advice I can lend to someone considering a post-graduate service is to understand a few ideas all revolve around having an open mind and an open heart. It will be the biggest challenge of your life, you will encounter many difficult scenarios that will help define the person you are and lay the foundation for who you want to become. It is important to have expectations of the experience, but understand that your expectations will not always align with your service. I had such a wonderful idea in my mind of what my year was going to look like prior to flying out to Chicago and within the first week, that idea got flipped upside down. Instead of complaining about the circumstance, I decided to be present in my placement and to meet each person I served with where they were in life. This was such a wonderful gift because it allowed me to change my perception of the person I am and what my mission is. You will not have all of the answers- but you can always be part of the solution. So many times I was forced into scenarios that I was not prepared for, but through graceful service and working with others, I found ways to make it work. The impact that you have on the individuals and communities you serve will pale in comparison to the impact that the individuals and communities have on your life. Not a day goes by when I don’t revisit a memory from my year of service.